Vacationing in South Florida can be the experience of a lifetime, but it can quickly turn into a nightmare if you party too hard or get into a spot of trouble. Running into small problems with the law in Florida, such as a DUI or a minor drug charge, as an out of state resident adds complexity to your situation. In fact, there are a multitude of tourists who get arrested while they are on vacation here. If you are a tourist in Florida, this is some information that is very important for you to know before you visit the Sunshine State. 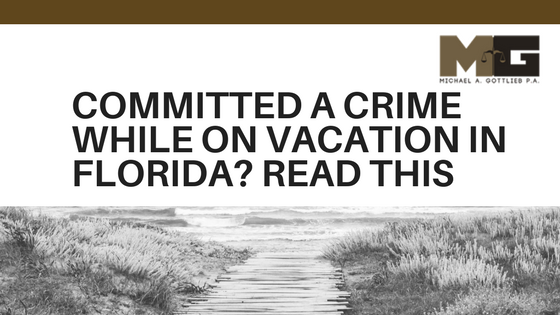 There are quite a few crimes that vacationers are regularly charged with while they are in Florida, including drug crimes, traffic violations, theft, and drunk driving offenses. It is very important for you to know that committing a crime while you are in Florida on vacation has severe consequences for you in your own state. If you miss an important court date in Florida, you may end up with a warrant for your arrest. When this happens, the state files an extradition order and forces you to return to Florida. Any penalties that are levied by a Florida judge may also follow you in your home state. For instance, if you have committed a drug offense in Florida, you could end up losing your driver’s license in your own state, or another similar penalty. As a visitor to this state, you have the same rights that you have in your own state. You have the right to an attorney, but your legal counsel needs to be allowed to practice within Florida. It can be especially helpful to have an attorney who has a lot of experience when it comes to working with out of state visitors who run afoul of the law in Florida. In these cases, an attorney may be able to handle all facets of your case until you can make it back to your home state. Sometimes, an attorney can even handle all of the hearings on your behalf without you having to travel back and forth. These attorneys will be in constant contact with you, which will allow you to know exactly what is going on with your case. An attorney ought to contact you through email or phone, depending on your preference.